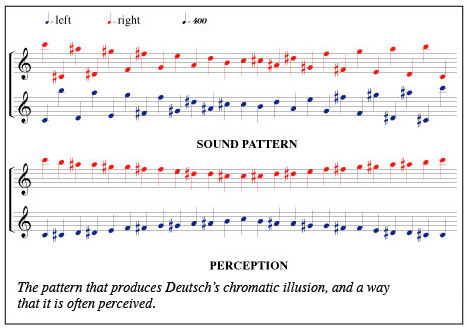 The chromatic illusion was discovered and first published by Deutsch in Audio Magazine, 1987. A chromatic scale is presented that ranges over two octaves. The scale is presented in both ascending and descending form, with the individual tone switching from ear to ear as in the original scale illusion. When the pattern is played in stereo, many people hear a higher line that moves down an octave and up again, together with a lower line that moves up an octave and down again, with the two meeting in the middle. Yet when each channel is played separately, it is heard correctly as a series of tones that jump around in pitch. The figure below shows the pattern producing the chromatic illusion and how it is perceived. When played through stereo headphones, righthanders again show a tendency to hear the higher tones on the right and the lower tones on the left, but lefthanders as a group are much more variable in terms of what they hear. For other variants of the scale illusion, see Butler, 1979. Butler, D. A further study of melodic channeling. Perception and Psychophysics, 1979, 25, 264-268.